Grace Floring, left, testifies in character as a former governor who filed a defamation lawsuit against an online newspaper during the 2017 mock trial competition. Floring is under direct examination her fellow Hayes senior, Gabrielle Cockerham. The judge in the case was portrayed by local attorney Dennis Pergram. A fierce legal battle will take place this Friday at the Hayes Building in downtown Delaware as students from several local high schools face off in the 2018 Ohio High School Mock Trial Competition. Students from Delaware Hayes, Big Walnut, Buckeye Valley, Village Academy, Marysville, and St. Francis DeSales will be role playing as witnesses and attorneys during the competition, which will be conducted in two sessions from 9:15 a.m. to 11:15 a.m. and from 1:15 p.m. to 3:15 p.m. The competition will be held in the courtrooms at the juvenile and probate court in the Hayes Building. The competition is a statewide event in which more than 3,500 high school students participate each year. Delaware County Common Pleas Judge David Gormley is the coordinator and said the high school students who participate in the program are given written materials that enable them to portray witnesses and lawyers on both sides of a fictional legal dispute, and they present their cases to three-member panels of local attorneys who have volunteered their time to serve as judges for the competition. Each team is comprised of five to eleven students, and each team participates in two trials on the day of the competition. Gormley said the fictional case for the 2018 mock trials was drawn from the popular podcast “Serial,” and it focuses on a post-conviction petition filed by a man convicted of murdering his ex-girlfriend. His petition alleges that his trial attorney mishandled cellphone evidence and failed to present the testimony of a potential alibi witness. 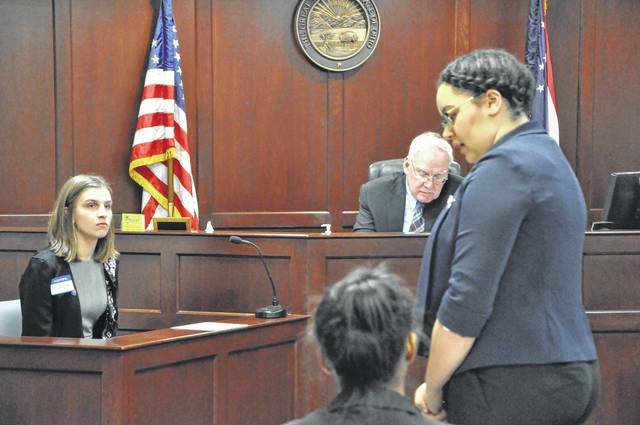 “Students who participate in the mock trial competition learn firsthand about the law and about court procedures, and they build analytical and communication skills,” Gormley said. District winners from throughout the state will advance to a regional competition on Feb. 16. The state finals are March 8-10 in Columbus. The annual high school mock trial competition is sponsored by the nonprofit organization the Ohio Center for Law-Related Education (OCLRE), which is funded by the Ohio State Bar Association, the Ohio Attorney General’s office, the Supreme Court of Ohio, and the ACLU of Ohio. Gormley said OCLRE also offers other programs designed to motivate young people to learn more about civics, government, and the law.